Tara Trust is an NGO that is unique in its approach to initiating positive change in society. It attempts to reach out to marginalised children coming from troubled backgrounds and economically backward families by planting the seed of artistic creativity in them and drawing out hidden skills. Tara Trust uses art and creative workshops, and intercultural programmes to instil in these children the value of education. By giving them a sense of ownership of a skill, Tara Trust builds self-confidence in young people. Tara Trust was founded in 2008 and has weekly workshops in 15 institutions across Goa including anganwadis, orphanages, government schools, children’s charity homes and schools for the specially-abled. 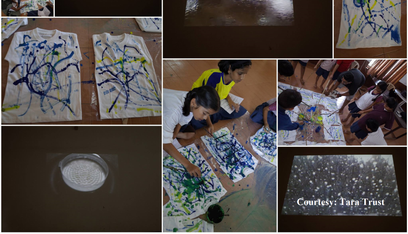 These workshops move beyond the limitations of mainstream education and allow a holistic development of the children through creative expression. Katharina says, ‘Every workshop is different, tailored around the needs of that particular group.’ Especially where the school children are concerned, it encourages them to learn in a way that is appealing to them and at the same time it motivates them to continue with their studies and make something of their lives. Aside from the weekly workshops there are awareness programmes on topics related to saving the environment, such as recycling, water conservation, pollution; and social issues such as equality of genders, and health and hygiene. These programmes are conducted once a month in institutions and schools, using presentations, games, creative work and team exercises to bring home the message to the children. Summer art camps and theatre workshops based on the techniques of the Theatre of the Oppressed are also employed to spread awareness in a productive manner. The 1000 Crane Project is a quarterly art exchange programme that started in 2011. It allows children from a poor and deprived environment in Goa to spend days in a new city in India imbibing novel social and cultural experiences. It encourages the children to form new friendships and develop life skills. India Support Projects involve the work Tara Trust does with its partner NGOs and institutions in other parts of India. The Jamyang School in Ladakh is given aid through fundraising and providing sponsors to pay for the free education of underprivileged children. The Shalini Fellowship Programme in Delhi is supported by Tara Trust and offers a three to six year scholarship for young women who cannot afford education at university level. The Naveen Nursery in Varanasi is another of the Trust’s partnering institutions which is assisted by way of finding funds and sponsors and conducting workshops. Katharina credits her amazing team of Juhi Pandey, Nancy Mascarenhas, Jen Kay, Shaili Dar, Geeta Jamuni, and the volunteers who work with the children, for the positive impact Tara Trust has had on so many lives. They will be putting the format of the workshops conducted online to inspire groups elsewhere to do the same after adapting them to the situation they are working in. Tara Trust does not just work with children but extends a helping hand to women from economically backward families too. 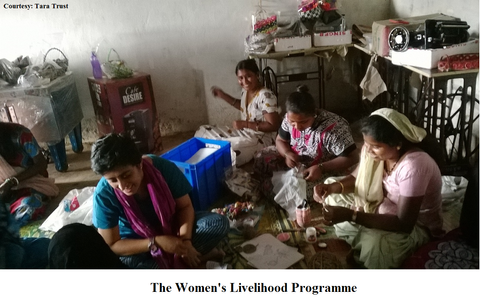 The Women’s Livelihood Programme, which is headed by coordinator Shaili Dar, focuses on the women from the Vasco slums. The aim is to enable these women to become independent by teaching them how to make and market quality products. At present Tara Trust handles the marketing of these goods and the women are given full access to all the money they generate. The success of this project has prompted other groups of women to ask for similar assistance. ‘It’s been a long struggle to build a solid foundation with rules in place,’ says Katharina. 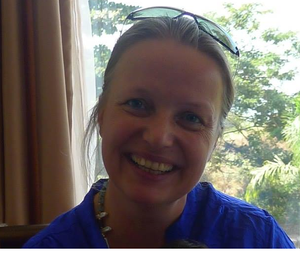 Though there is no hurry to expand the NGO since Katharina believes in the effectiveness of small groups, things like dealing with paperwork, training staff in the initial stages, etc, were quite an effort. ‘But the struggle is worth it because of the positive impact on women and children,’ she says. Tara Trust endeavours to form a lasting relationship with these children using creative methods to enable them to perceive learning as a fun activity, and alter their attitude towards life. ‘I believe it is tremendously important to be connected to your creative self. This is very much underestimated. People think they give donations for the poor and that is it. That is an initial need. But to build the self is very important. Otherwise how do you survive in a world where there is so much competition and you suffer so much humiliation being born in a life situation where you never have the same chances,’ says Katharina, who feels that even if some of the children are equipped with self-esteem and self-confidence as a result of the Trust’s work with them then Tara Trust has accomplished its mission.